(Nanowerk News) If they’re quick about it, “hot” electrons excited in a plasmonic metal can tunnel their way across a nanoscale gap to a neighboring metal. Rice University scientists said the cool part is what happens in the gap. A Rice team discovered those electrons can create a photovoltage about a thousand times larger than what is seen if there is no gap. The finding shows it should be possible to create nanoscale photodetectors that convert light into electricity and can be used as sensors or in other sophisticated electronics. Results from the Rice lab of condensed matter physicist Douglas Natelson appear in the American Chemical Society’s Journal of Physical Chemistry Letters ("Photothermoelectric Effects and Large Photovoltages in Plasmonic Au Nanowires with Nanogaps"). Natelson’s lab studies the electronic, magnetic and optical properties of nanoscale structures, often by testing the properties of systems that can only be viewed under a microscope. Some studies involve whole gold nanowires, and sometimes the lab breaks the wire to form a gap of just a few nanometers. One goal is to understand whether and how electrons leap the nanogap under various conditions, like ultracold temperatures. While looking at such structures, the researchers found themselves studying the nanoscale characteristics of what’s known as the Seebeck (thermoelectric) effect, discovered in 1821, in which heat is converted to electricity at the junction of two wires of different metals. Seebeck discovered that a voltage would form across a single conductor when one part is hotter than the other. 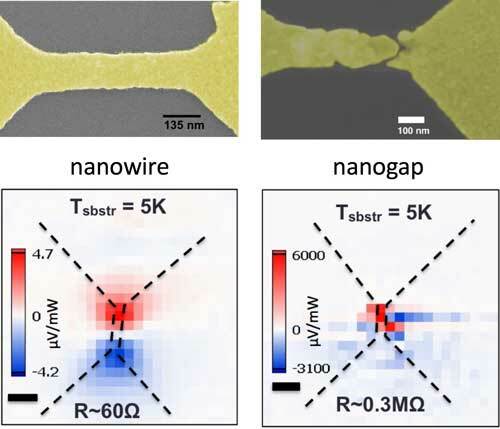 To see how it works in a single metal on the nanoscale, Natelson, lead author and former postdoctoral researcher Pavlo Zolotavin and graduate student Charlotte Evans used a laser to induce a temperature gradient across a bowtie-shaped gold nanowire. That created a small voltage, consistent with the Seebeck effect. But with a nanogap splitting the wire, “the data made clear that a different physical mechanism is at work,” they wrote. Gold is a plasmonic metal, one of a class of metals that can respond to energy input from a laser or other source by exciting plasmons on their surfaces. Plasmon excitations are the back-and-forth sloshing of electrons in the metal, like water in a basin. This is useful, Natelson explained, because oscillating plasmons can be detected. Depending on the metal and its size and shape, these plasmons may only show up when prompted by light at a particular wavelength. In the bowties, laser light absorbed by the plasmons created hot electrons that eventually transferred their energy to the atoms in the metal, vibrating them as well. That energy is dissipated as heat. In continuous, solid wires, the temperature difference caused by the laser also created small voltages. But when nanogaps were present, the hot electrons passed through the void and created much larger voltages before dispersing. “It’s a neat result,” Natelson said. “The main points are, first, that we can tune the thermoelectric properties of metals by structuring them on small scales, so that we can make thermocouples out of one material. Second, a focused laser can act as a scannable, local heat source, letting us map out those effects. Shining light on the structure produces a small photovoltage. Gold seems to be the best metal to show the effect so far, Natelson said, as control experiments with gold-palladium and nickel nanogapped wires did not perform as well. The researchers acknowledge several possible reasons for the dramatic effect, but they strongly suspect tunneling by the photo-generated hot carriers is responsible.